Did you know that there are new debt collection rules in the works as you read this? The Consumer Financial Protection Bureau (CFPB) is trying to address the concerns of consumers who called them to complain about debt collectors. Apparently, some collection calls have become abusive threatening, harassing and downright degrading. The bureau is stepping in to make sure that this abuse will stop. If your debt situation is getting worse and you know that you are close to defaulting on your accounts, you should expect that collection calls will start coming in. The longer it takes for you to pay off your debts, the more debt collectors will start bothering you. According to an article published in the Wall Street Journal, around 70 million Americans have at least one debt in collections. That means a lot of consumers are struggling to pay off their debts. If they know that they are about to be bothered by debt collectors, they should pay attention to the new debt collection rules that the CFPB is going to implement. At the moment, the new rules are still being discussed by the Small Business Review Panel. This panel will get feedback from key players in the industry to ensure that it will be for the best interest of everyone. After their feedback, that is the only time the CFPB will finalize the new rules that the debt collection industry should follow. So what are the new debt collection rules? Here are the important details from the ConsumerFinance.gov . Collectors should make sure the correct debt is being collected. The new rules will demand that debt collectors validate the debt they will collect. That means they should be able to confirm that they possess enough information that will enable them to check that they have the right debt and borrower in the file. Not only that, they should have the information that will prove they are still legally allowed to collect the said debt. Collectors should provide clear debt details. This should be done during the initial contact with the borrower. If the debt is beyond the statutes of limitations, this should also be disclosed. The form that will serve as the initial contact will include a tear-off portion that the consumer can use to send a dispute, payment or response to the collector. Collectors should respond to the tear-off portion. If the tear-off sheet is sent within 30 days after the initial contact is made, the collector should respond. They cannot communicate with the borrower unless the report and verification that was requested are completed. Collectors are only allowed 6 communication attempts every week. They are not allowed to go beyond that. This includes all types of communication, whether it is through phone calls, emails, or snail mails. Also, if the consumer prefers to use a specific communication method, this should be honored by the collector. For instance, if they only want to be contacted through a phone call from 1 to 5 pm, the collector is expected to comply. Collectors should wait for 30-days after a borrower passes away to get in touch with their surviving family members. Collectors are not allowed to collect or sue the borrower without adequate documentation and proof. Any inaccuracy or doubtful information should be verified before getting in touch with the borrower. Collectors should address the dispute even if it is passed on from one collector to the other. The CFPB hopes that these debt collection rules will minimize the complaints filed by consumers. Although the debt is something that borrowers should take accountability for, the debt collection complaints prove that some of the players in this industry would resort to dirty tricks just to get consumers to pay. Dealing with debt in collections is not an experience that you want to have. It can be very stressful to deal with debt collectors – even more so because you are probably beating yourself up for not being able to pay it off. According to the data provided by NewYorkFed.org, there is an estimate of $652 billion worth of debt that is currently delinquent. $442 billion of that amount is considered to be seriously delinquent – which means it is late by at least 90 days. All of this reveal that a lot of people are behind on their debts and it can be assumed that they are in the midst of a debt collection struggle. If you are part of this statistic, here are some tips that you can use to help you survive the ordeal. Keep your emotions out of it. 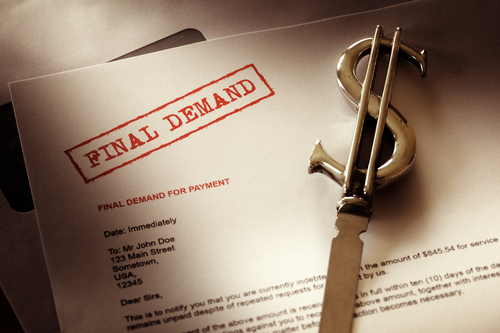 Debt collectors will try to manipulate your emotions so they can get you to pay off your debts. Try to keep your emotions from the negotiation because you might end up making the wrong decisions. Do not allow yourself to get scared or feel threatened. If you cannot pay off the debt, do not force it because you might make your financial situation a lot worse. Know your rights. It also helps to understand your rights. By educating yourself about the old and new debt collection rules, you will know when the collector is bluffing and when they are serious. Validate the debt. Always validate the information that the collector is giving you. If the debt is not yours, dispute the collection and do not send anything. Send the collector a cease and desist letter. Do not let them bully you into paying a debt that you did not make in the first place. Document everything. Regardless if the debt is yours or not, make sure every communication is documented. Get a written proof of the debt and log every call, email or letter from the collector. If the new debt collection rules are implemented, this will come in handy when you are filing a complaint with the CFPB. Do not be intimidated. If you know your rights, you will not be easily intimidated by the collector. Feel free to negotiate and speak up if you know that you are correct in your knowledge of the debt. Whether it is yours or not, the debt collector should never intimidate or force you into anything that you will not agree to. The debt collection process is truly a nightmare for some consumers and the CFPB is well aware of their plight. This is why they are continuously improving the debt collection rules that will keep collectors from abusing the rights of the consumers. Question: What does debt collection mean? Answer: Debt collection usually happens when a borrower fails to pay their monthly dues in time – or have missed payments for at least 30 to 90 days. When the credit account is delinquent, the debt is sent to the collections for a more aggressive means to get the borrower to pay what they owe. Question: What is the debt collection process? Answer: When the debt is considered delinquent and sent to the debt collector, the borrower will be informed of the debt they missed to pay. Whether the borrower confirms or disputes the debt will define what will happen next. If they dispute the debt, the collector should verify the information and if found that the borrower should be liable for the debt, they can choose to keep the collection efforts or take things to court. If the borrower confirms the debt, they can negotiate a payment plan that will satisfy both creditor and borrower. Question: Where to complain about a debt collection agency? Question: Who pays debt collection fees? Answer: The borrower can be the one to pay the collection fees – although it is included in the debt that they will pay. There are also times when the collection agency is given a commission for every debt they will collect. Question: Who governs debt collection agencies? Answer: The Federal Trade Commission (FTC) is the agency that regulates the practices of debt collection companies. For complaints, you can also go to the CFPB or the State Attorney General’s office.